Dunkleosteous, the most fearsome predator of the ancient seas that once covered Ohio, is captured in this 1993 painting by William E. Scheele. 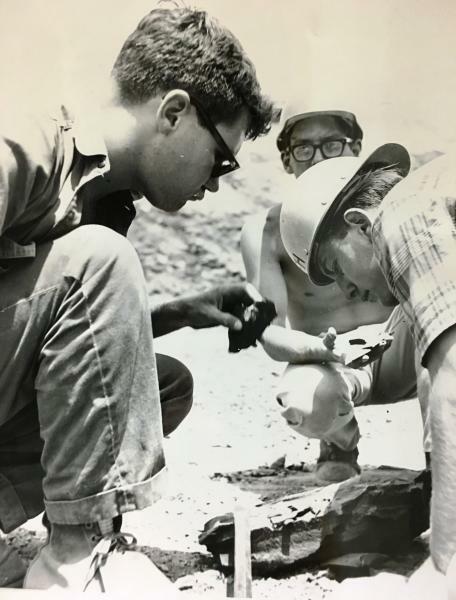 As director of the Cleveland Museum of Natural history in 1965, Scheele hired a crew of young scientists to rescue fossils uncovered by the I-71 dig. It was a race against time 50 years ago. Construction crews were carving out the 10-mile stretch of I-71 from Cleveland's downtown west to the airport. As the highway engineers dug deep into the fossil rich Cleveland shale, local scientists scrambled to recover a treasure trove of 360-million-year-old sea life buried there. 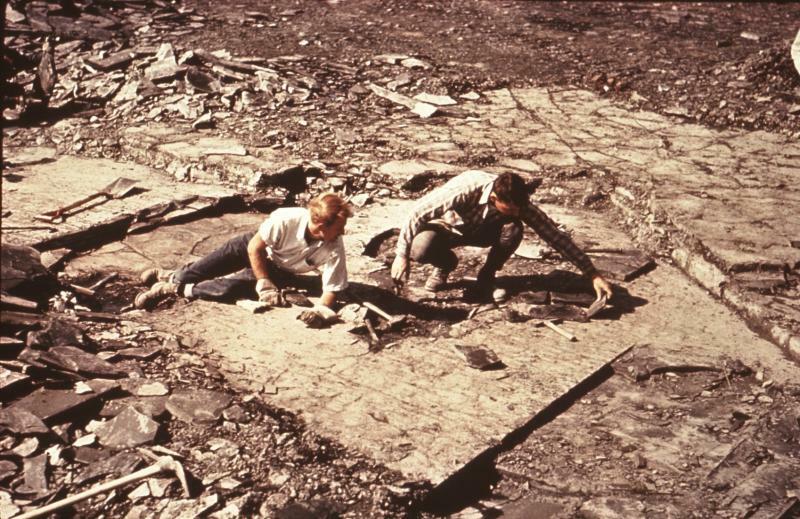 “I was a young pup at the time,” says Harvey Webster, now director of wildlife resources at the Cleveland Museum of Natural History, who in 1965 volunteered to join the couple dozen young volunteers and staff hired by museum director William E. Scheele to rescue the fossils dug up along the Big Creek corridor west of downtown. Webster was part of the team mobilized to pick through mounds of rocks excavated by road crews. 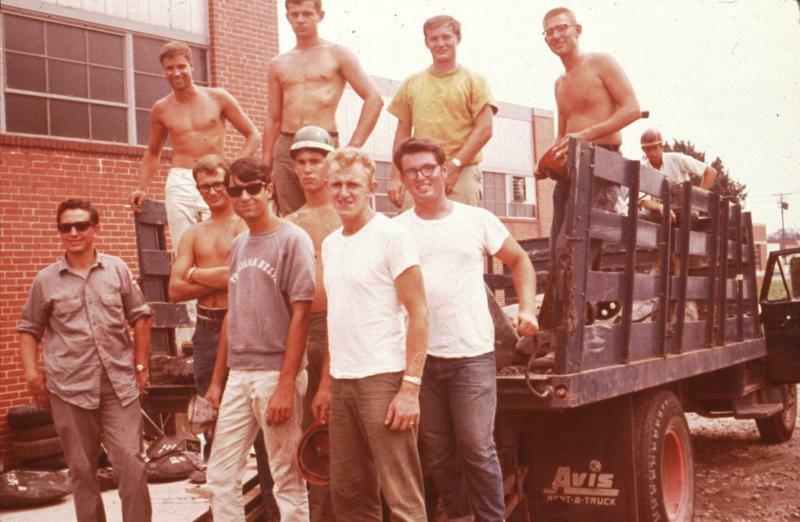 Museum crews worked seven days a week, through all seasons, following the backhoes and bulldozers as the interstate was pounded into shape from 1965 through 1968. "We would go to these places where they had piled up heaps of concretions," the mushroom shaped nodules that often contained fossils, he says. "Using our hammer and chisel, we’d tap at them to see if there might be some cool thing on the inside." They found lots of cool stuff. Ohio was once part of an ancient landmass called Euramerica that lay near the equator, and its warm waters teamed with life. 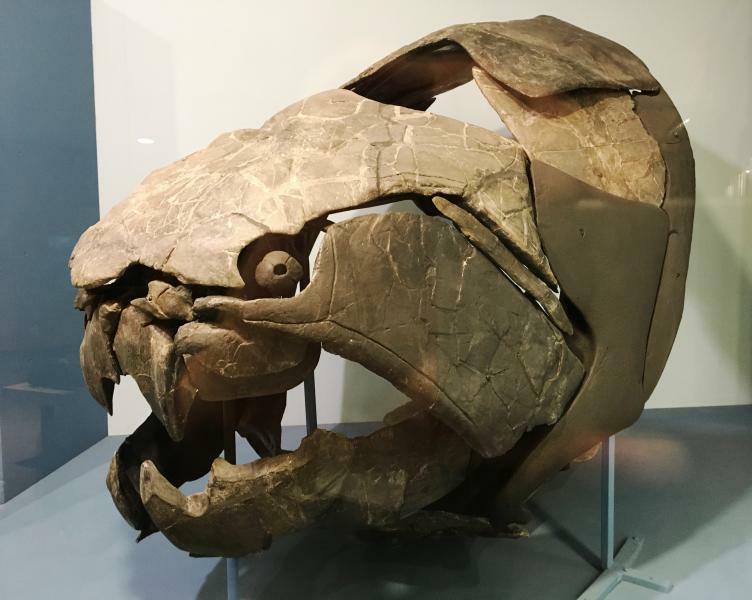 More than 50 varieties of sharks and ancient armored fish called placoderms are found preserved in Cleveland rocks, including the Devonian era's top predator, a monstrous armored fish called Dunkleosteous. It's named after the museum’s former curator, David Dunkle. The Cleveland shale is perfectly suited for preserving fossil impressions. It's formed from the fine clay particles that continuously filtered down in the shallow sea that covered this continent 360 million years ago. Dead fish and plants that fell to the bottom were quickly covered in silt and slowly turned to stone. Fossils from the fine-grained Cleveland shale, "are the oldest and best preserved anywhere in the world," according to Webster. And in 1965, director Scheele wanted them saved. “It’s kind of like you married a beaver from hell with an Orca," says Webster. Most of the fossil-laden shale from the I-71 dig is still stored in the museum’s basement, says Webster, "with rack upon rack of partial pieces of bones in them, waiting to be teased out and prepared." In 1965, Bill Hlavin was an associate curator at the museum. At the age of 22 or 23, he led the young crew of volunteers rescuing specimens from the heaps of construction debris before they were bulldozed into backfill. He remembers the biggest motherlode of fossils came from the few blocks between 128th Street and 143rd Street, some of which surround us here in the basement labs. He says of the gaping fish skulls that surround us, "they're like our children." The I-71 sea creatures are special not just for their abundance. They’re also the best-preserved fish fossils found anywhere in the world. Collections Manager Amanda McGee shows us an ancient shark so detailed that we can see the remains of its last meal. “These are all the scales and skull bones of a small bony fish called Kentuckia hlavini," she says, "which was named after Bill. In another room, preparator Lee Hall points to shelves full of dark shale slabs. "These racks are full of I-71 specimens exclusively," with dusty labels written by Hlavin half a century ago. He still has a twinge of regret for what was left behind. Buried beneath the highways and houses of Cleveland, he says the complete story of an ancient ocean may never be known. But thanks to Hlavin and his team, we have a glimpse of the abundant life that once swam here.